Pugel combines economic analysis with the issues of today’s economic policy. Concise and readable, analysis includes economic terminology to help students build their understanding of global economic developments and evaluate proposals for policy changes. International economic events are presented within a historical framework informed by current events and the latest in applied international research. Pugel is intuitive rather than mathematical and strongly oriented towards policy. CHAPTER 5 Who Gains and Who Loses from Trade? 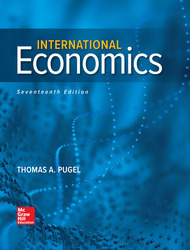 CHAPTER 19 What Determines Exchange Rates? CHAPTER 22 How Does the Open Macro-economy Work?